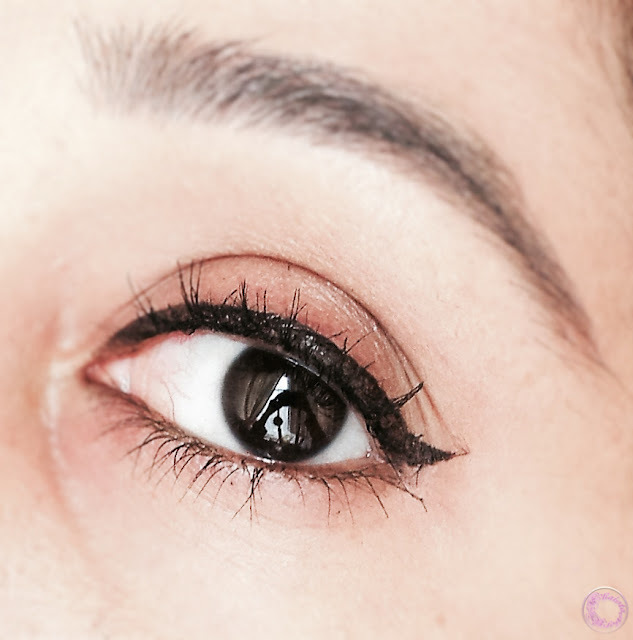 As I am so in love with this eyeliner, I decided to write a whole review post. 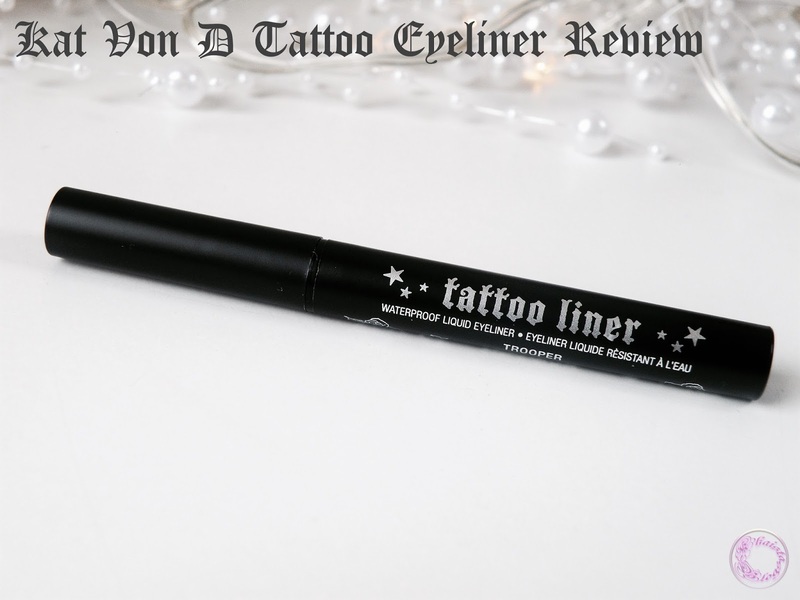 Kat von D eyeliner looks like a traditional felt tip eyeliner pen. But there is a twist in the story. 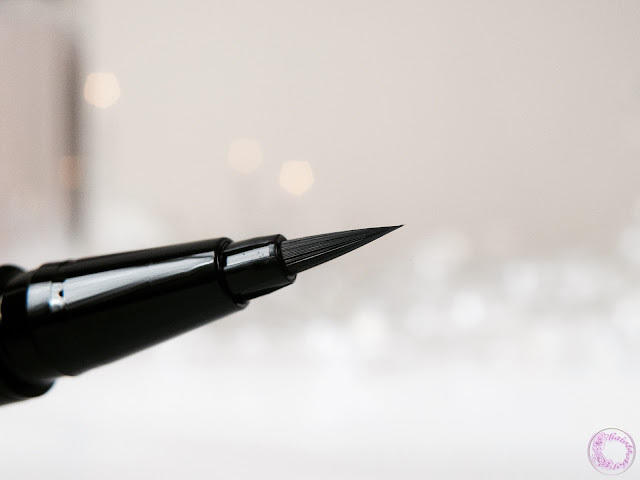 The nib of eyeliner is not made of felt but is actual brush. The brush is very sturdy. 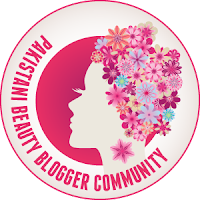 So many tiny synthetic bristles are tied together firmly and securely which makes the brush very easy to glide all around the eye. Initially I thought that it would be difficult for me to control the brush because of being very flexible and bendy. However, I found it quite easy to handle and is perfect for precise application. The brush tip is very pointy to achieve clean and crisp lines in a single stroke. I am absolutely rubbish when it come to do wing eyeliner. If I want a perfect wing, it usually takes me about ten minutes. But trust me this tiny wing took me under two minutes on each eye. I had a hard time with felt tip eyeliners in the past. After sometimes the tip kind of gets flimsy and usually breaks. It also disrupts the flow of product to the tip, resulting in skipping of product and patchy application. But tattoo eyeliner brush is helping in a smooth flow of product to the tip. Always makes sure that you close the lid firmly after every use to prevent the eyeliner from drying. Tattoo eyeliner itself is ultra-pigmented and waterproof. It sets quickly and dries pretty fast. I have oily lids and it stayed put for more than 8 hours on me. Despite of being long wearing and waterproof, it required minimal effort to remove. A dab of cleanser and it came right off. The finish of this eyeliner is not super matte though. I personally don’t like very glossy finish, that is only reason I prefer gel eyeliners over liquid. There is a tiny bit a shine to it but it can be tamed down with black matte eyeshadow. Kat Von D is now officially launched in UK and you can get the products from Debenhams. I am looking for a new eyeliner at the moment - I might just get this one sounds good!